After our little scare with the Mac Mini last week, the little boxen that could is quickly becoming my favorite computer (still can’t wait to get one with Leopard on it). So seeing cool applications of it like this one thrills me to no end: Andrew sent us his writeup of putting a Mac Mini into a Corvette (complete with touchscreen monitor) as a music player. 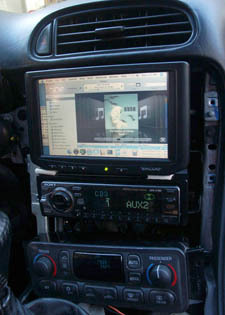 The whole process looks pretty complicated to me– the most I’ve done with my car stereo is install an old CD player, and by install I mean “watched my friend do it.” But Andrew’s writeup is really thorough, and he goes through everything from choosing components to creating a layout, to potential problems during installation, and what he plans to do next. Apparently the Mini is almost tailormade for car systems like this– not only is there a special cable built to power it in the car, but there is even a special version of Front Row designed to be controlled from a touchscreen. Not everything worked well, however– the Mini had a grounding problem, apparently, and Andrew had an issue with the Mini’s volume setting reverting after a restart, but he was able to punch out an Applescript to fix it. The end product looks great– Andrew says he’s still working on the mounts, but considering he’s got a working touchscreen controlling a Mac Mini in his Corvette, that’s good enough for me. Very nice.